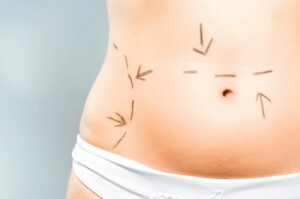 Tummy tuck usually costs between $5,000 and $9,000 for a single procedure, and liposuction costs between $3,000 to $8,000. The downtime for tummy tuck is 2-4 week, with full recovery being 4-8 weeks. For liposuction the time is less, a week of downtime and 3 weeks for recovery. I have two young children and the family would spin into chaos if I was down for 2 days, let alone weeks! You can only safely remove a maximum of 6-8 pounds of fat with liposuction. For all that money you spend, the fat that can be removed is only 6-8 pounds MAX. I have lost more than that amount of weight before without even trying, so knowing how little fat would be removed made the whole thing seem so pointless. Just google the term “tummy tuck scar” and look at the images on Google — scary! The thing about scars is that even if it is not something that other people notice, it is something that I would know is there and see everyday. I have trouble enough dealing with minor acne scars that something major like that would really bother me. The biggest reason of all for not getting plastic surgery for my belly is: It wouldn’t make me any healthier. Having a tummy tuck and liposuction out the extra fat would not give me more energy, make me healthier, or make me a better mom. Now that I have spent a good amount of time working on myself and setting healthy habits, I am certain that I would never entertain the idea of a tummy tuck or liposuction again!